Navratri, the 9-day religious extravaganza, has been kicked off on a filmy note. The first look of Sanjay Leela Bhansali's much awaited film Padmavati, featuring Deepika Padukone, has been released. Looking every inch of a royal figure in the two looks, Padukone owns the frame and commands respect. 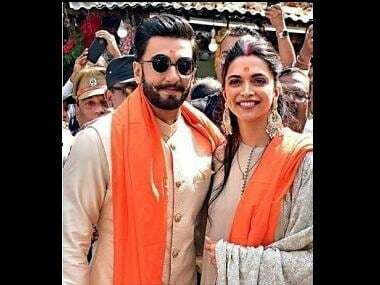 The actor is playing Rani Padmini aka Padmavati of Chittod, alongside Ranveer Singh's Alauddin Khilji and Sahid Kapoor's Raja Rawal Ratan Singh. All decked up in a traditional lehenga, the actor sports a uni-brow which makes her look very different from her look in Bhansali's Bajirao Mastani. She had played the second wife of Maratha Peshwa Bajirao I, in the 2015 spectacle. In one of the looks, Padukone can be seen joining her hands, showing deep reverence, while in the other poster, she cuts an authoritative figure. The actor stands tall, evoking admiration in her heavily embellished pink and orange attire. The official logo of the film was released on Wednesday, marking the arrival of the film. After being mired in multiple controversies and mishaps, the film will finally release on 1 December.